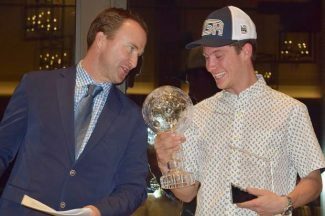 On the precipice of the biggest moment of his young snowboarding career, 19-year-old Jake Pates of Eagle only needed to tell his father Chris two words for dad to know the big moment they’d been working toward was one trip back up the halfpipe away. 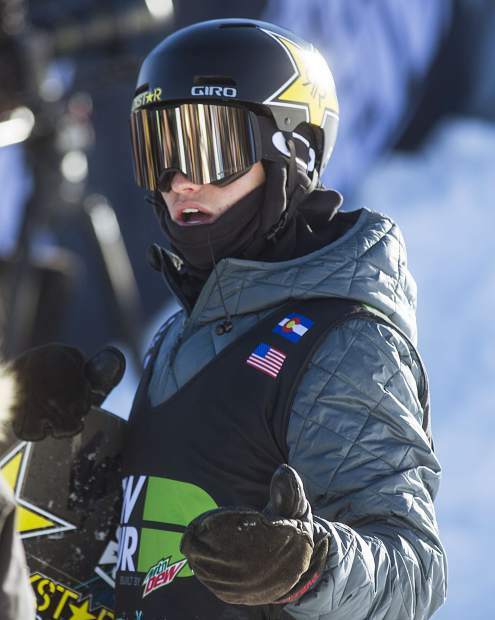 “It’s on,” Jake Pates told his father at the bottom of the Dew Tour superpipe after his second run. What Pates was referring to was confidence in himself to land a trick he’d only landed three times before and never in competition: A Back Double 12 with a tail grab. 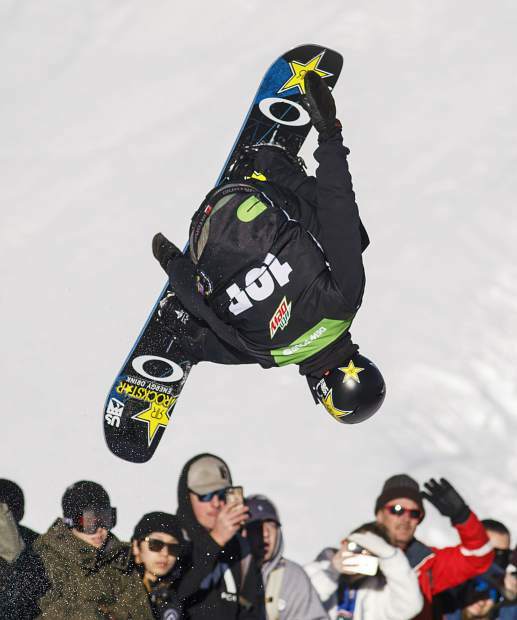 By executing it on his third and final run at Friday’s Dew Tour Men’s Snowboard Superpipe final, the I-70 corridor local Pates took the Dew Tour championship with a score of 97.33. 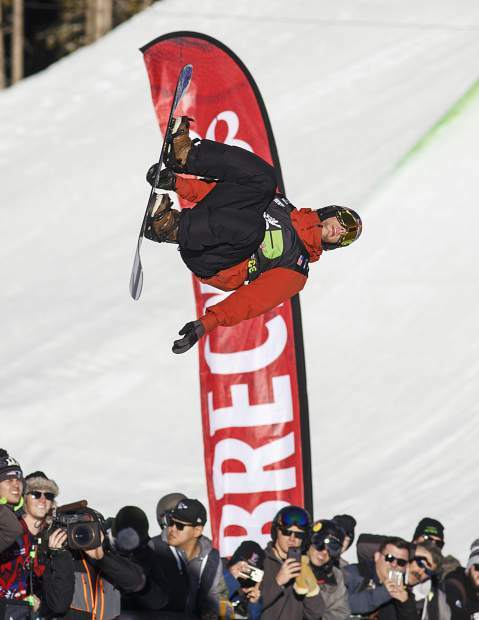 In the lead up to this week’s Dew Tour, Pates essentially had the trick in his bag, waiting to pull it out at the Dew Tour and U.S. Olympic qualifier at Breckenridge Ski Resort. After Chris Pates saw his son score an 80 on his first run without the new trick, he knew if and when he landed it, an appearance on the podium was a strong possibility. Back at the top of the superpipe, Pates was the second to last snowboarder to drop in. 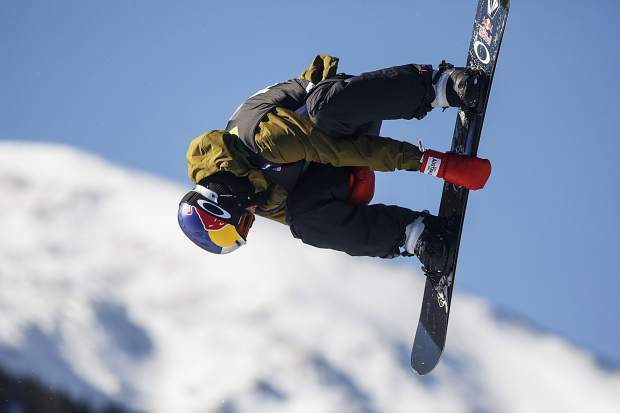 When he did, he trailed third place Ben Ferguson of the U.S. (89.00 on his second run), second place Ayumu Hirano of Japan (91.00) and first place Scotty James of Australia (95.00). 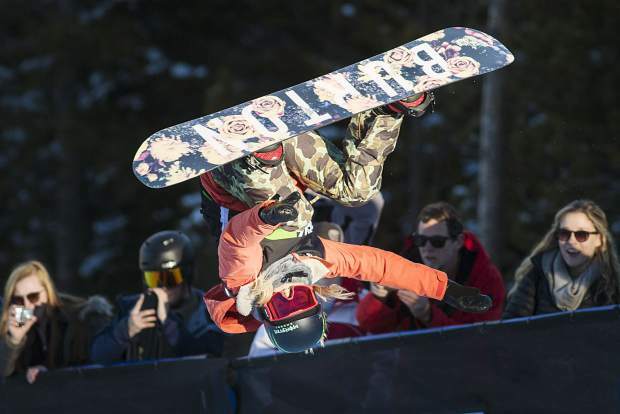 On the heels of other exciting runs, such as the soaring amplitude of Hirano, at the bottom of the halfpipe, Pates’ sister Charlie Sue had a feeling her brother was vibing the right way to score big and take his first big step toward his goal of the Olympics. When he dropped in, Pates actually went through an audio blunder of sorts. Unable to get his earbuds to change a song, he’d have to listen to Kodak Black while he traversed the pipe, whether he wanted to or not. As his son descended the halfpipe, Chris was able to see Jake take off and seamlessly run through his first four hits. Once Jake landed a Front 9 smooth and high on the halfpipe wall, Chris immediately turned his head to the Dew Tour screen to witness what he knew was coming: the Back Double 12. “I love you,” Pates said to his father after he landed the run. Pates’ family and friends were raucous after the run, knowing he’d likely done enough to podium. So while waiting for the judge’s score, Chris asked his sister and Jake’s Aunt Ellen to fill up Jake’s Rockstar bottle with water in the event the Rockstar athlete needed to rep the sponsor on the podium. When Pates was awarded a 97.33, it finally hit Charlie Sue what that run meant for her brother. Dad also passed his phone over to Jake so Pates could talk to his brother back in Boulder, who was streaming Jake’s final run in between studying for finals. 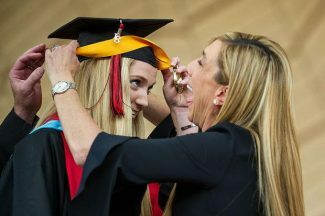 “He literally called me afterwards and he was bawling his eyes out,” Pates said. 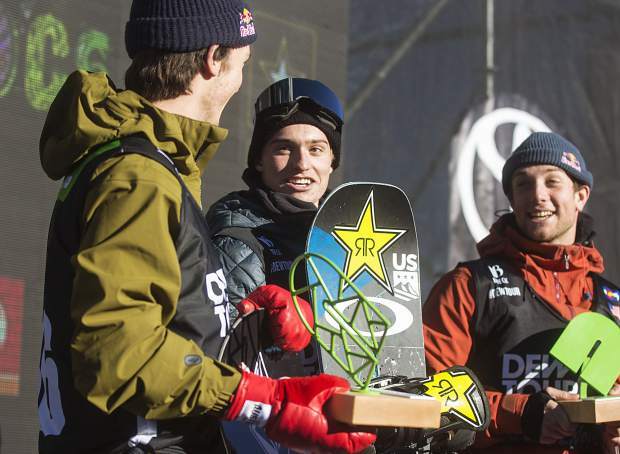 Chris and Charlie Sue attributed Pates’ phenomenal run to win the Dew Tour title on Friday to his mental strength and focus on having fun while out on the halfpipe. For father and son entering the day, the goal wasn’t a podium. Rather, it was to land runs. And whatever that meant in terms of scores, so be it. 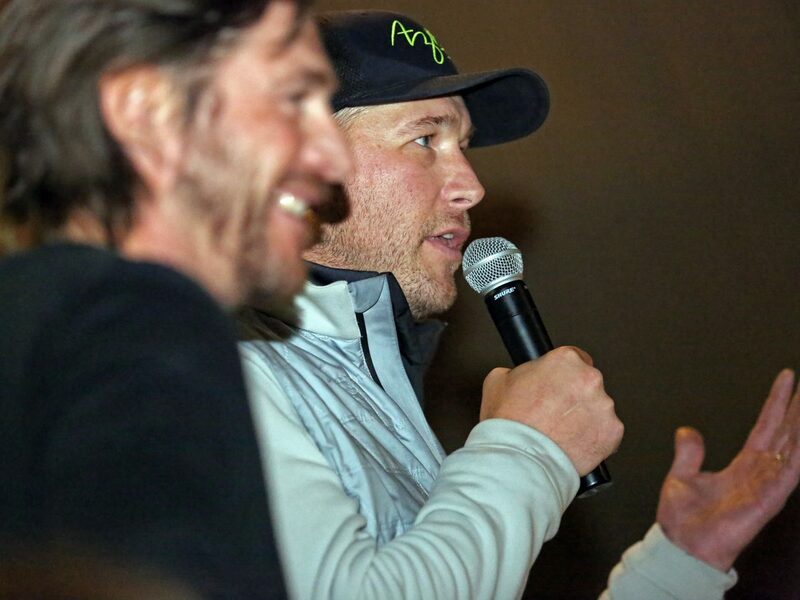 A lifelong snowboarder after his mother Amy taught him to shred — that is, back during a time when Chris was sidelined with a broken neck —Pates preaches a “feel good” approach to his craft. As long as he’s keeping positive heading into competitions, he figures everything will turn out alright. As for the Olympics, Pates is a monumental step closer with the first place finish. 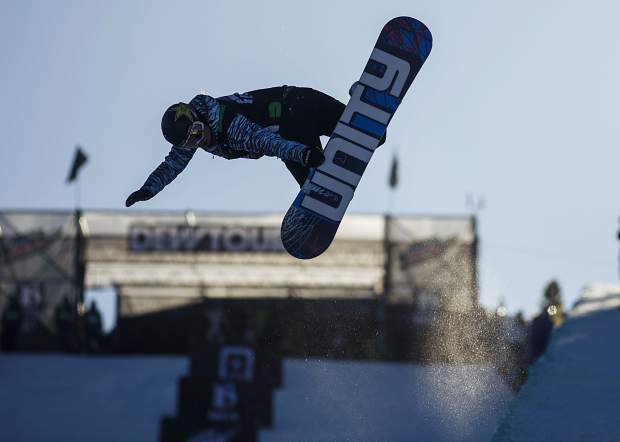 For Team USA halfpipe snowboarders, three spots on the Olympic team will be given to the athletes who meet the objective criteria, which is a podium finish at a qualifying event, such as last week’s Grand Prix at Copper and this week’s Dew Tour. 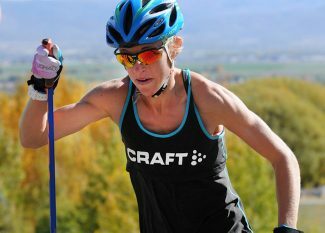 Other qualifying events are Jan. 10-12 in Snowmass and Jan. 17-19 in Mammoth, California. A fourth Olympic team spot will likely — but not definitely — be given to a competitor of the coaches’ choosing: It’s totally subjective. And for the objective spots, if more than three athletes have podium finishes, then the team will defer to the World Cup scoring system, which will give the American athlete with the best result 1000 points, the American with the second best result 800 points, the third best 600 points and so on. Those with the most points make the team. Pates’ first place Friday was massive for him, as he not only got on the podium but he took the top spot. Fellow American Ben Ferguson of Bend, Oregon also podiumed, putting together a run of 92.00 immediately after Pates’ final run to finish behind the 96.00 of Scotty James of Australia. Combined with his second place finish at the Olympic qualifier at Copper Mountain Resort last week, Ferguson is in ideal position to qualify.